Our range of Vertical Autoclaves is appreciated for its qualitative features among the clients and serve the requirements of various industries. 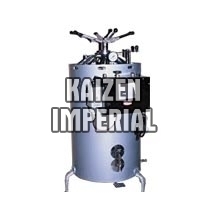 We offer Vertical Autoclaves in various specifications to suit the demands to the clients. We are a prominent Manufacturer and Exporter of Vertical Autoclaves from India.